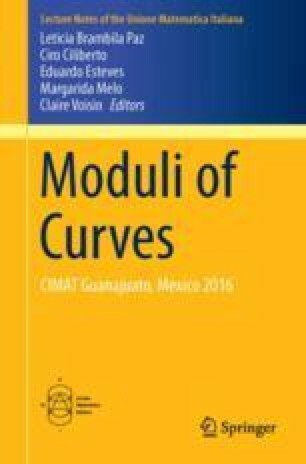 This survey is modeled on the CIMPA introductory lectures I gave in Guanajuato in February 2016 about moduli of curves. Surveys on this topic abound and for this reason I decided to focus on few specific aspects giving some illustration of the relation between local and global properties of moduli. The central theme is the interplay between the various notions of “generality” for a curve of genus g. Of course these notes reflect my own view of the subject. For a recent comprehensive text on moduli of curves I refer to Arbarello et al. (Geometry of algebraic curves, Springer, Berlin, 2011). I want to warmly thank the Organizing Committee of the CIMPA School for inviting me to lecture in Guanajuato. Special additional thanks go to Leticia Brambila Paz for her perfect organizing job and for her enthusiastic presence during the school. I also thank the other speakers and the participants for creating a friendly and stimulating atmosphere. I am grateful to the referee for a careful reading and for useful remarks.